An Illegal Dump Survey, a concept developed by PA CleanWays in 1990, is a tool for documenting the number of illegal dumps in a community, identifying root causes, educating community stakeholders and the general public, and garnering support and resources to combat the problem. Westmoreland Cleanways and Recycling (then PA CleanWays of Westmoreland County) conducted its first illegal dump survey in 1991, with 140 sites identified. A follow-up illegal dump survey was conducted in 1997 to assess the effectiveness of PA CleanWays’ efforts since 1990. Using more comprehensive techniques for identifying dumpsites, surveyors identified 115 illegal dumpsites in Westmoreland County, some that were originally identified in 1991 and some new sites. They did NOT include sites that were identified in 1991 but that had been cleaned up in the intervening years. Volume of trash was estimated by truckloads. For purposes of comparison, the 1991 survey estimated that the identified dumpsites contained 495 truckloads of trash (a truckload considered to be a single-axle dump truck); 254 truckloads of trash were actually cleaned up between 1991 and 1996; an estimated 542 truckloads of trash remained in the sites identified in the 1997 survey. More accurate estimation techniques most likely contributed to the increase in estimated volumes of trash from 1991 to 1997. A third illegal dump survey was conducted in 2009, again to measure the effectiveness of PA CleanWays/Westmoreland Cleanways and Recycling methodology in combating illegal dumping, to identify any remaining or new illegal dumpsites, and to spot trends since the original survey was completed. The 2009 Illegal Dump Survey contained some interesting data. Better tools (digital photography, GPS) and methodology in spotting illegal dumping resulted in a much greater number of sites being found by surveyors than in previous surveys, although the volume of trash found at each site was less. The purpose of identifying these small sites would be to alert stakeholders to the potential problem areas before they become unmanageable. In fact, the estimate of 312 sites containing 336 tons of trash equates to an average of just over one ton of trash per site (picture the bed of a pickup truck). A follow-up to the 2009 survey was done in 2013 with some additional work in 2015. Volunteers re-visited several communities to check the status of dumpsites identified. By 2015, 58 sites had been cleaned, removing a corresponding 59 tons of trash. Unfortunately, a lot of sites still remain. Check out the Cleaned Sites 2015 Update, and a list of sites still available for cleaning..
With three surveys in 15 years, where the trash is in Westmoreland County is pretty clear. Most neighbors and municipal officials know where the sites are that are continually dumped after repeated cleanup efforts. Many of those sites are listed on the illegal dump surveys. With an average of just one ton of trash per site, many of these sites could be easily tackled in a couple of hours by a few volunteers with very little effort. The Great American Cleanup of PA occurs every spring sponsored by Keep Pennsylvania Beautiful and PennDOT. It’s a great time to organize a cleanup after a long winter; the landscape looks especially dirty and dreary in the spring, so enthusiasm runs high. BUT — Westmoreland Cleanways and Recycling supports cleanup efforts YEAR ROUND by providing free supplies: trash bags, safety vests, gloves, road safety signs, free disposal and logistics support when necessary! Cleanups are easier in the spring and fall before the vegetation, insects and vermin become a problem, but in many instances, the trash can be removed without a problem at any time. Volunteers call throughout the year looking for projects; the best way to volunteer is to choose an illegal dumpsite needing cleaning and organize friends and neighbors to get the job done. It’s that simple. Illegal dumping is defined as discarding waste in an improper or illegal manner, where it doesn’t belong and/or where environmental damage is likely. Illegal dumping occurs when a person (or business) discards waste where it doesn’t belong rather than disposing of it through proper channels, through a licensed waste hauler, recycler, or permitted landfill. This often occurs because proper disposal is too “inconvenient,” the perpetrator does not want to pay the disposal fee, or does not take the time to prepare the material for proper disposal. Illegal dumps are typically (but not always) found in rural communities, in sparsely populated areas, and along little-traveled roads. Hidden embankments are prime dumping spots. Almost half of identified illegal dumpsites are directly in or within 50 feet of a waterway. Types of trash typically found in illegal dumpsites include automobile tires, old appliances, furniture, construction and remodeling debris, and household trash. Increasingly, television sets and computer monitors are showing up in illegal dumpsites because of the cost and restriction on disposal. Take the first step to reverse the illegal dumping trend by reporting a dumpsite or by sponsoring a cleanup. Illegal dumping poses a direct threat to the health and safety of humans and animals. 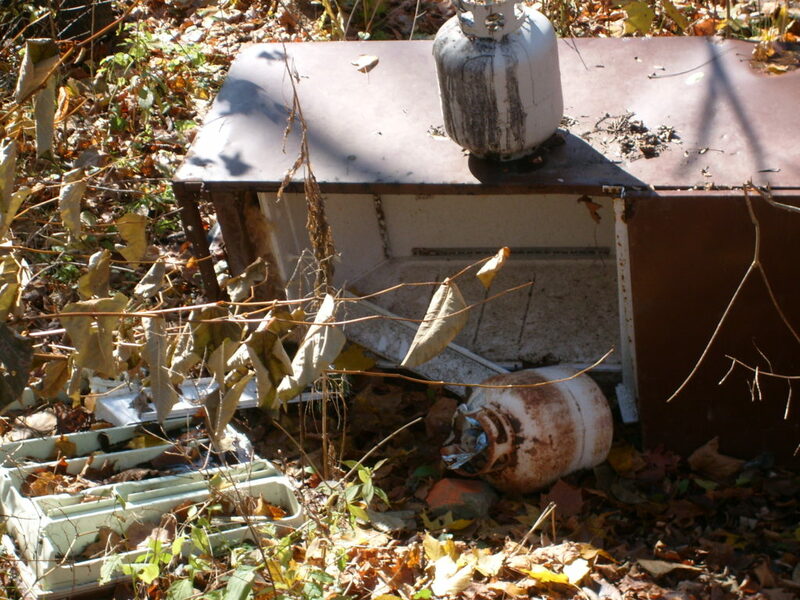 Illegal dumping attracts disease-spreading rodents and mosquitoes by giving them a place to live and breed. West Nile Virus, carried by mosquitoes, has been a primary concern for environmental officials. Illegal dumps also can be a source of physical injury for humans and animals due to broken glass, rusty metals, and toxic substances. Environmentally, illegal dumping pollutes our soil, surface, and groundwater supplies, as well as the air we breathe if a site catches on fire. The emissions released by the burning plastics and household hazardous waste can be extremely toxic. It is also aesthetically unpleasing and ruins the beauty of natural areas, including many public places such as community parks and state forests, parks, and game lands. Illegal dumping poses a threat to a community ’s drinking water supply when toxins leach out of the trash through rain water and snow melt, enter the groundwater or directly into a waterway, and work its way into the community’s source water supply. Aquatic life and wildlife are also adversely affected by toxins leaching from illegally disposed trash. Illegal dumping takes its toll on property values and community pride. Whether in an urban area or rural, once a neighborhood starts to take on that neglected, litter-strewn or trash infested appearance, community pride and investment go by the wayside. Economically, illegal dumps are expensive to clean up. Government agencies spend millions annually on cleanup efforts. The estimated cost to clean up a site can be anywhere from $600 to over $1,000 per ton for clean up and removal.